Asian equities lacked direction early Thursday, with rising bond yields boosting finance stocks in Japan and Australia, though Chinese markets experienced selling pressure ahead of a week-long holiday. Japan’s Nikkei Stock Average NIK, +0.53% pared early gains and was last up 0.3%, recovering from Wednesday’s declines when companies paid dividends. The gains also come as the yen continued to pull back, with the U.S. dollar marking a 2½-month high in late New York trade. Barring further pullbacks, the Nikkei is poised to end September with its best monthly performance the year. Shares of banks and insurers, which are large holders of U.S. government bonds, drove gains in Tokyo shares, with T&D Holdings 8795, +3.23% rising 2.6%, Dai-ichi Life Holdings 8750, +2.64% adding 2.1% and Shinsei Bank 8303, +1.75% 1.7% higher. “The plan leaves scope for details to be adjusted, allowing compromises and resultant conciliation, which is likely to boost its chances of getting passed,” said Mizuho Bank analyst Zhu Huani. In Australia, banking stocks drove the benchmark index higher, though gains narrowed by late morning. Macquarie Group MQG, +2.11% was up 1.9%, with Commonwealth Bank CBA, +0.28% , National Australia Bank NAB, +0.38% and Australia and New Zealand Banking Group ANZ, -0.08% adding about 0.2% each. The S&P/ASX 200 XJO, +0.14% was last up 0.1%. 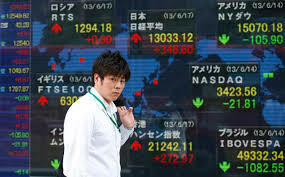 Elsewhere in the region, the Kospi SEU, +0.08% failed to hold on to gains, trading down 0.2%. If the weakness continues through to the close, it would mark the first time in about 3½ years that the Kospi fell for eight straight sessions. In Hong Kong, the Hang Seng Index HSI, -0.31% was down 0.4%, while the Shanghai Composite Index SHCOMP, -0.09% was off 0.2%. Traders are taking profits ahead of the weeklong National Day holiday in China, analysts say, though Hong Kong markets will be open for parts of next week. Meanwhile, Hong Kong’s biggest share listing of the year had a strong debut on Thursday. ZhongAn Online P&C Insurance 0672, -0.89% , a Chinese insurance-technology firm, opened up 16% and was last trading 12.1% higher. Still, analysts said investors should remain upbeat on the region’s prospects, following stronger industrial-goods data out of China and a better U.S. factory goods reading, both for August. “It is very clear that investors are responding to a better growth outlook,” said Michael McCarthy, chief market strategist at CMC Markets in Sydney.